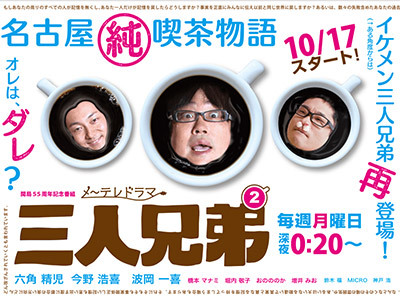 The three unpopular, poor, spineless Mano brothers &#8211; Kinichi (Rokkaku Seiji), Ginji (Konno Hiroki) and Dosan (Namioka Kazuki), who have been running a coffee shop which was the inheritance from their father, are on a trip. However, they get stranded on a beach and all three of them suffer memory loss. They are rescued by a lady (Hashimoto Manami) who had been walking on the beach. Ginji is the first to regain his memory and makes up a story about his relationship with his brothers.